A pergola is an outdoor structure usually consisting of columns or posts and an open roof with cross beams that are often used for “outdoor living room.” Pergolas provide light and inviting space to relax, dine or just admire. 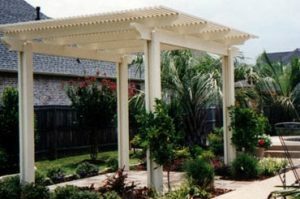 At Texas Custom Exteriors, we have provided reasons why pergolas can be an excellent addition to your outdoor living space. For visual interest and romantic appeal to your landscape, a pergola can be “dressed up” with flowering or fragrant vines growing up and over the rafters and down the vertical posts. It is a great way to protect pavement or walkway. Adding a pergola maximizes your usable outdoor space by adding an area for outdoor furniture that is somewhat protected from the elements such as brick flooring, concrete pavers or even a deck when combined with pergolas, can create a further definition to your outdoor space. Pergolas are durable and low maintenance. Let’s focus on Vinyl pergolas for a moment; the Vinyl product doesn’t chip, peel, splinter, warp, rot, fade or become discolored. Unlike wood pergolas, they aren’t susceptible to termites and other insects. Vinyl is easily your best option. With mentioned this before and we will say it again. Pergolas can be customized based on how your landscape is designed. With a sculptural and architectural design, it can create a visual interest to an otherwise basic backyard.